Despite a slow start to the season and a winless period spanning almost 3 months, Giampaolo’s side are currently 12th with one remaining game. Looking past a league position, the coach has been able to develop the system his predecessor left which has given Empoli one of the most interesting and entertaining identities in Italy. As noted previously on Spielverlagerung, Empoli lost an excellent coach in Maurizio Sarri over the summer of 2015. The 57-year-old coach had taken Empoli up into the Serie A on the second time of asking and installed the unique style of play that we enjoy seeing today. With Empoli on due course for their highest finish since the 2006/7 season, one could definitely suggest that Giampaolo has made a positive impact on Sarri’s old team. Adding his own mark on their playing style, the side have progressed from last year and recently surpassed last season’s points tally with a draw against Bologna. Football has developed somewhat of an obsession with ‘stretching the play’ and making the pitch ‘as big as possible’ when in possession of the ball. Regardless of ball position, many teams aim to have a presence on either touchline at all times and in doing so look to stretch the oppositional defence. Even when it isn’t always effective, numerous teams persist with this as if it is the only way to open up an opponent’s defensive block. Empoli pose a threat to this trend. Very rarely, if ever occupying both flanks simultaneously, Giampaolo’s side prefer to have a much greater focus on spaces around the ball. The diamond in midfield remains compact at nearly all times and ensures short distances between the players as they develop strong connections through smaller areas on the pitch. With a formation that is more inclined to a narrow midfield, they favour playing through small spaces with a high density of players rather than covering more space and opening gaps through a broader attack. It’s common to see them neglect the ball-far half of the pitch as the players all take up positions closer to the ball where they can have a more direct impact on the progression of the ball. Empoli have good occupation of the wide areas through the ball-oriented nature of the shape. With an emphasis on having numerous players positioned in close vicinity to the position of the ball, Empoli’s structure is very much ball-oriented in possession. Especially in the development of possession, they try to have multiple options for the ball-carrier and support in the spaces around him. Empoli impose a strong presence in the spaces around the ball which can strengthen the possession in a multitude of ways. These strong connections between the players are integral to numerous aspects of their possession game but most importantly their ball circulation. With often 4 or more players taking up positions in close vicinity to the ball, Empoli can execute fast combinations. The quick consecutive passes allow the team to quickly penetrate the opposition’s lines of midfield as they play well through the diamond in midfield with strong support from the two forwards. Without these short distances between players through which the passes could be made then it would be extremely difficult for Giampaolo to integrate the same playing identity which he has. The short passing and combinations would be less achievable and likely not as effective whilst the players’ ability in small spaces wouldn’t be utilised to a sufficient extent. With an attack more compact than how the vast majority of defences are usually organised, this area of Empoli’s possession game poses an unusual threat to the opposition. High levels of defensive compactness becomes a necessity in order to stop the Tuscan side from easily finding free men in gaps to move the ball higher. Unsurprisingly, this level of defensive organisation is not always achieved by their opponents and it can be highly problematic for them as shown in the below example. Empoli have high numbers of players close to the ball to create ball-local overloads. Their ball-orientation is effective in nearly all areas of the pitch meaning that regardless if the ball is in the in the centre or deep on a flank, the man in possession has strong support. The midfield block in particular follows the movement of the ball quite closely with well-co-ordinated shifts allowing them to maintain near-constant access. This is particularly important for the flanks where the ball-carrier has limited space to work with and with most teams, usually a small number of teammates in support. Empoli can thus work to compensate for the strategical limitations of these areas by supporting the ball well with high connections to the ball-carrier. With a greater number of passing options and positional support, Empoli’s ball-security and ability to progress the ball remains at high levels despite the weak position. Through this, Giampaolo’s side are able to develop ball possession in wide areas because the negative qualities of these spaces are counterbalanced by the characteristics of the system. Through moving wider, midfielders can find space away from the densely-compact centre. One of the only situations in which Empoli move away from this compact and ball-oriented shape is in the individual movements of the midfield and forwards. It’s quite common to see one of the wide central midfielders or a forward move wider away from the centre of the pitch and often away from his teammates and the position of the ball. With the midfield often densely-occupied, its quite common to see the ball-far forward move away from the ball into open spaces. From this position, he can then act as a free man with the oppositional press being focused on the ball. This allows for switches to be made into the underloaded areas to allow ball progression away from a crowded midfield. 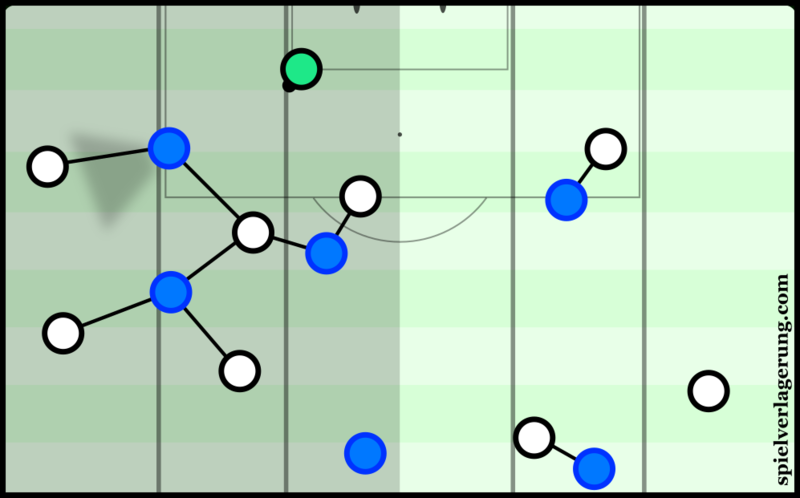 Because of Empoli’s narrow positional structure, the opposition adjust with a similarly-narrow orientation and thus the ball-local areas become crowded. In turn, spaces further away from the ball become much more open which creates opportunities to progress the ball away from oppositional pressure. Through this mechanism Empoli can draw out individual opposition defenders and with now more space to work with, create a situation where they can more easily play forward. The opposition players are now much more disconnected from the ‘main’ block and have to cover more space giving Empoli greater opportunity to progress the ball through the half-space. Through the lateral movements, Empoli can open the centre to play through. Under Giampaolo, these movements have been used more as a mechanism to open space in the centre. With the side preferring to attack with short passes through ball-local spaces, it becomes crucial for Empoli to be able to open spaces and passing lanes immediately upfield. Through these movements, they can do exactly that by dragging defenders apart and opening gaps between them. A common beneficiary of these patterns is Riccardo Saponara who often occupies the spaces left by the midfield and forwards soon after they abandon their original positions, as shown above. With a higher capability to open the midfield spaces, Empoli are more able to play their attacking vertical passing game and progress the ball upfield. The increased access into the centre and stronger connections to players such as Saponara give the side ways to channel the ball upfield through the midfield at speed. When the forwards move away from their respective positions, it’s common for Empoli to situationally lack presence in the front line. The opposition have an opportunity to push up and further restrict the space in midfield whilst the lack of a player in the striker position can be harmful to Empoli’s own game. Because of this, Saponara is often required to move up himself to recreate the presence lost by the absent strikers. Although this shift isn’t always executed to a high standard, it represents an aspect of what is quite a dynamic positional structure. With lots of support around the ball, Empoli improve their security in possession. A benefit of the dense structure around the ball is an enhanced security in possession. The plethora of options for the ball-carrier gives Empoli a degree of pressing-resistance if their opponents aim to close them down. It becomes more difficult for the opposition to account for and cover each Empoli player as the press loses its effectiveness to some extent. This feature is effective in stabilising the side’s construction of possession, as the heightened resistance to oppositional pressure gives them a greater capacity to maintain the ball when challenged by the opponents. They’re able to commonly play combinations which assist in their efforts to evade the oppositional press through dynamic ball-circulation and small-scale overloads as depicted below. With the ball changing position multiple times in a short period of the time, it becomes quite possible to break the opposition’s defensive access. Most teams are unable to adjust to the ball moving at such a high rate and their ability to press effectively is diminished. Their possession is stabilised in the moments after they lose the ball too. With a compact shape in possession, the structure in defensive transition is thus also immediately compact. Pair that with the usually-short distances in the passing through the midfield as well as the ball-orientation and Empoli can create a strong situation for themselves to counterpress in. Their compact starting shape supports their defensive transition even if they don’t counterpress. Despite this, it’s surprising to see that their attempts to counterpress are quite rare as they prefer to take a less ‘aggressive’ approach to the moments after losing the ball. Instead of immediately looking to regain the ball after losing it, Empoli are more inclined to retreat and take up a defensive position closer to their own goal. This approach represents a more reserved plan which seems quite rigid considering Empoli’s theoretically-strong position to counterpress upon loss of the ball. Regardless, their compactness still gives a degree of stability for the defensive transition. The players’ short distance to the ball and the spaces around it allows them to cut off passing options which could otherwise start a fast counter-attack. Although they don’t necessarily apply pressure on the ball in the same way a Bayer Leverkusen or a Liverpool do, this access gives them the potential to slow and reduce the threat of the break whilst they reorganise themselves accordingly. It would definitely be interesting however to see if a more counterpressing-focused reaction developed considering the pre-existing aspects of their possession game. With Empoli’s possession game being largely based upon short distances in the midfield, they often have strong levels of defensive access upon losing possession with the ball within the reach of multiple players. Another distinct characteristic of Empoli’s game model is their focus on verticality in their ball circulation. When in possession of the ball, they take a fairly direct approach to goal with frequent direct flat passes to move the ball upfield. Giampaolo’s side look to gain space quickly in the attack and move forwards as fast as possible with constant pressure on the opposition defensive block. This vertical-focus in their ball circulation has a large impact on the dynamics of the attack. With the intentions of gaining space quickly in attack, the overall tempo of their possession game is quite high. It may not seem so during their construction of possession, as they can circulate the ball horizontally as they look to open passing lanes into the midfield and forwards. However once these lanes are found, Empoli’s intensity becomes much greater as they look to progress the ball upfield at a great pace. The high-tempo nature of their attacks are necessary in many ways for the side to be a threat in the opposition half. One of the main components of vertical passing is its capacity to move the ball directly towards the opposition goal and past oppositional lines of defence. Once a line of defenders is breached, they must work to backwards-press and re-establish a position to defend the ball again. Therefore, it’s important for the attacking team to quickly continue the attack forward in order to prevent the defenders from getting back into position. If Empoli’s attacks are slow and lack intensity then the vertical passing will be less effective as they give the opposition the opportunity to regain defensive stability. The use of vertical passing is a common tool when developing quick counter-attacks from deep positions. The main concept around counter-attacking is for the breaking team to move the ball forward at pace in order to exploit the opposition’ defensively-unbalanced shape. With vertical passing being one of the quickest ways to gain space, the two can often come hand-in-hand. Upon regaining the ball in deeper positions, Empoli are fast to execute these vertical passes to quickly move the ball upfield to expose the gaps in the opponent’s retreating defence. In doing so, it allows them to progress the ball with pace and reduce the opposition’s ability to close off these holes in time. Empoli can use their vertical passing to quickly open the space on the counter-attacks. Empoli’s vertical staggering sees the midfield occupy different heights up the pitch. In order to facilitate strong vertical play in possession, Empoli’s positional structure must be tailored to allow effective progression of the ball. Aside from the above-mentioned compactness and ball-orientation, Empoli also stagger themselves effectively inside the opponent’s defensive block. The biggest advantage they gain from this staggering is the differing vertical positions of the midfield players. With the diamond often occupying 3 or more different lines, they’re better equipped to take up positions between the lines of opposition. It immediately becomes more difficult for the opposition to effectively cover these different spaces as Empoli’s capacity to break lines of defence is increased. This occupation of the spaces between lines is then extremely beneficial to their vertical game. The vertical passes are used mainly to break oppositional lines of defence and Empoli’s intelligent staggering gives them greater ability to find free players to receive these passes. When discussing the logistics of vertical passes, one of the problems with them is the angle at which a player receives it. Unless they’re moving onto the vertical pass from an angle, they will generally receive the vertical pass facing their own goal and with their back to the opposition’s. Because of this, some obstacles can be found in continuing the attack forward. Firstly, if the recipient is pressured immediately by a defender (and given that many of these passes are made within the defensive block, this is very common) then it becomes very difficult for the attacker to turn and face the goal. It’s also then challenging to maintain the dynamic of the attack with the receiver facing away from the opposition’s goal; his field of view is weak with a limited capacity to move the ball forward. Giampaolo’s side work well to work around these issues through the common use of ‘wall-passes’ and lay-offs immediately following the vertical pass. If Saponara receives a vertical pass, he quickly lays the ball back to a nearby player who is facing forwards and thus is in a better position to continue the attack. By using these quick lay-offs, Empoli can maintain a high tempo in their vertical passing towards the opposition goal without the delays caused by the body orientation of the recipient. The positional structure is an important component in facilitating this aspect of Empoli’s vertical game. In order to make these quick lay-offs, the recipient obviously needs strong positional support from teammates in close vicinity to whom he can immediately make the wall pass to continue to progress the attack. 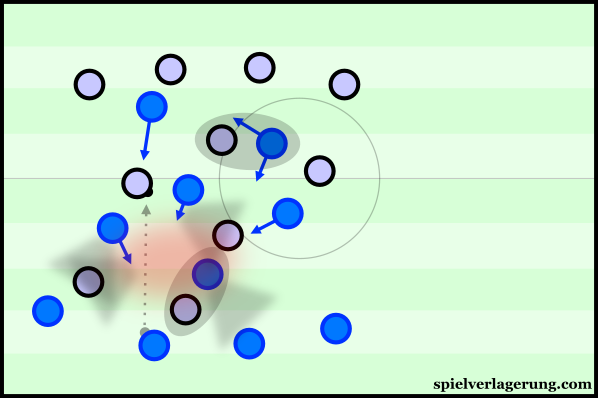 On a closer level, the timing of these movements is key in order to maintain the dynamic and rhythm of the attack – if the 3rd man moves too late then he misses the lay-off, if he’s too early then he will have to slow down and could possibly move past the ball, resulting in a broken down attack. These wall-passes can be used to quickly escape from pressured situations. The use of these lay-offs can also be a means of retaining possession of the ball and evading pressure of the opposition defence. In order to penetrate lines of defence, vertical passes often have to be made at a high velocity which can be problematic for the player controlling it. When they do receive the ball, it’s common for the defence to then collapse around the surrounding spaces, the ball is now in a dangerous position and they want to prioritise the act of neutralising that threat. Because of this, it can be difficult to maintain possession following a vertical pass. Yet, with the option of quickly laying-off the ball to a teammate (or even making it a return pass) the pressure can be avoided with some potential to open up newly-created gaps due to the collapsing of the oppositional defensive shape. Leandro Paredes’ radar, thanks to @fussballradars for providing it! Starting at the foot of the midfield quartet, Leandro Paredes has enjoyed somewhat of a break-out season after failing to force himself into the Roma starting eleven last year. At just 21-years old, he was tasked with replacing Valdifiori who had been vital in Sarri’s Empoli team and the young pivot has certainly done what was asked of him. The Argentinian is particularly technically-gifted and is more-than comfortable in possession of the ball, displaying a great proficiency to evade opposition pressure and create space for himself in a congested midfield. Using quick feet in order to fend off attempted challenges, Paredes’ pressing-resistance is one of his biggest strengths as he shows good agility to pivot his body to quickly carry the ball out of the direction of any incoming tackles. In what is often a densely-compact midfield from both sides, this pressing-resistance is often a necessity for the young pivot. He is often required to carry the ball away from pressure of the opposition and maintain possession in tight spaces. During such moments, the midfielder displays a deceptively-strong physical presence and protects possession well with his body often between the ball and opposition. One of the biggest contributors to Empoli’s vertical passing, the 21-year-old’s passing style is very direct as he constantly looks for ways to move the ball towards the opposition goal. Often overseeing the entirety of the attack from his deep position, Paredes acts well as a ‘quarter-back’ of sorts and always attempts to break open lines of defence. The young midfielder does have a tendency to make turnovers with these passes, though he definitely does more good than bad with his style being a proponent of Empoli’s direct nature. Another unusual component of Empoli’s game is the behaviour of the defensive line during ball possession. When a team is playing out from the back, it’s very common to see the full-backs move up and stretch the midfield whilst a holding midfielder drops between the two centre-backs. This isn’t something you’re likely to see at Empoli however. When it comes to Giampaolo’s team, the full-backs stay deep in the team’s structure and act in much deeper positions whilst the centre-backs maintain a narrower position. A back four is formed which makes up the base of the shape with the wings left relatively uncovered. This obviously has a big influence on Empoli’s possession game in multiple areas. One of the biggest impacts of the deep full-backs is the stability which they provide during the build-up phase. When bringing the ball out of defence, the team must prepare in some capacity for a potential loss of possession and the inevitable defensive transition during these cases. If they lose the ball in these moments, it’s close to their own goal and the oppositional counter-attacks carry more threat. Empoli’s deep full-backs in build-up. Through creating a deep 4-chain in the first line, Empoli give themselves greater security when the opposition win the ball higher up the pitch. In the case that they do lose the ball, they have a stronger defensive coverage of the width which immediately gives them better support. When teams lose the ball within their own third, there are often large open spaces which the opposition team can quickly move the ball into to generate shot opportunities. With an extra 1 or 2 players in the first line however, there are fewer open spaces for the counter-attacking team to move the ball into. If they lose the ball in build-up, their deep defensive line helps their ability to recover. Stability can also be found before they lose the ball to the opposition. As a result of the additional players in the first line, Empoli can benefit from a greater level of pressing-resistance. Empoli have a greater capacity to overload oppositional pressure using this defensive line and especially so in wide areas, where they benefit from the support of the ball-near midfielders too. Empoli can create overloads in the 1st and 2nd lines of players to help construction of possession. When under pressure, the defensive line can stagger themselves too in order to increase the number of connections and create an ‘out-ball’ of kinds. A centre-back will drop into a deeper position to occupy a different passing angle compared to the other centre-back to vary the options for the ball-carrier. This mechanism serves as yet another a means of evading oppositional pressure as Empoli can work to stop the possession from becoming isolated in deep positons. The below video is an example of this put into practice. With a large number of players within the 1st line, Empoli create an overload through the right flank which allows them to quickly progress the possession. Despite Palermo’s attempts to press inside the box, Empoli’s strong presence helps them to bypass it rather easily and move forward to a now little-protected midfield. When compared to a 2 or a 3-chain, the distances between the players are also significantly shorter. These closer connections between players also gives stability with shorter and generally more secure passes made across the defensive line. With a shorter distance covered in each pass it is more consistently accurate which in turn supports the circulation, particularly in relation to the dynamic and speed of it. Extending on this matter, the shorter distances between players allows for a better position for supporting mechanisms if the ball is turned over as I touched on above. The connections between a 2, 3 and 4-chain. Shorter distances in connections are not always a positive aspect and there is a limit which comes with them. If the distances are too short between the players then issues arise with them occupying the same space. In these moments, it is a good opportunity for oppositional pressure against a poorly-spaced structure. Empoli’s shorter-connections generally are strong however and they often work well to maintain effective spacing. These short distances allow them to make their highly-effective combinations without stepping on each others’ toes. Looking from more of an offensively-grounded perspective, the deeper full-backs give Empoli the opportunity to open space in higher areas to progress the ball forwards. Their deeply-positioned 4-chain commonly forces the opposition to move more players forward in order to effectively apply pressure on the ball. If they press with fewer players, then they’re often underloaded and their pressure can be worked around with ease. Unless they’re co-ordinated at a high level, it is often necessary for the defending team to push midfielders forward to join in the press to disrupt Empoli’s build-up. However through doing this, they often play the risk of leaving open spaces in the midfield for Giampaolo’s side to then progress the ball into. This is avoidable, of course, if a team understands how to move effectively as a defensive block to maintain compactness however it is rarely seen on a consistent basis. As a result, Empoli have a means of moving the ball forward by drawing out the opposition during build-up. Another aspect to consider is the unusual nature of Empoli’s defensive line in build-up. Although a number of teams such as Bayern, Barcelona and Villareal have used a similar shape to counter specific opponents, there are few sides who consistently build with a deep back four. This perspective provides some explanation for cases where teams have not been able to coordinate their press effectively against Empoli’s build-up. It’s common to see teams press without success as they struggle to establish access whilst the movements aren’t always co-ordinated well with one another. Although it’s difficult to give a true and certain answer, it could be that teams struggle to adjust to pressing a team with deep full-backs. As opposed to pressing a wider 3-chain or just the 2 centre-backs, the movements and positioning of the pressers are quite different which could make adjustment difficult if the press lacks flexibility. Even against teams such as Juve, Empoli have at times been allowed to move the ball forward into open gaps as the opponents fail to create an effective press which covers the avenues forward. Considering that Juve press with quite clear man-orientation this is perhaps less of a surprise as it could entail players venturing into positions that they aren’t familiar with, especially when pressuring the full-backs. Opening the wing spaces for ball progression. Another way in which Empoli draw the press out can be seen in the wider areas of the pitch. Although it is becoming less common, many teams in football simply have their wingers mark the opposition full-back when in defence. As a result of this individualistic defensive role, they can often be disconnected from their midfielders as they follow their man without much consideration of alternative reference points such as the ball position or their own teammates. What happens then, when the full-back is suddenly positioned 10-15 yards further away from the winger in a deeper position? The opposition player follows and moves far away from his teammates. Thus, the disconnect becomes even greater with space being opened around the wing areas for ball progression. As I referenced previously in the article, Empoli use lateral movement from the midfield and forwards to sometimes exploit the open gaps in wide areas and this comes directly into play in these moments. With the winger dragged out of position and the full-back often deep or occupied by the ball-near striker, it’s possible for a midfielder to drift over into empty gaps in wider positions to receive a pass forwards. The defensive line in Empoli’s attacking play is also rather unorthodox. Still based around maintaining compactness, the ball-near FB moves higher into a position where he can to stretch the play on the touchline. On the other hand, the ball-far one stays deeper within the defensive line. Through this deeper positioning, the ball-far full-back can create a 3-man defensive line whilst Paredes can take on a role within the midfield instead. Like many features of their possession game, this asymmetrical defensive line supports Empoli’s attempts to create overloads and have high presence in spaces around the ball. Effectively, this adaption allows Empoli to have one player closer to the ball. Instead of having the ball-far stretch the shape on the opposite flank, his narrow positioning highlights Empoli’s compact shape with possession. The support of the defensive-line gives the ball-near full-back greater freedom to take on more attacking positions where he can support the overloads and stretch the opposition towards the touchline. Without the ball-far full-back stretching the play, one wouldn’t be criticised for thinking that Empoli’s ability to switch play is quite weak. Yet this isn’t often the case, as they make rather good use of the opposite half of the pitch which is often left wide open by both teams as they are focused moreso on the areas surrounding the ball. Both full-backs display a good situational understanding and time their movements well when they break away from the block to move into the open opposite half. With two densely-spaced teams, Empoli can relieve pressure and progress the ball through switching to the opposition full-back. This mechanism is beneficial for two main purposes. Firstly, with the two teams condensed into a small area of the pitch, the pressure on the ball-carrier can easily become too much and a switch of play is required. Although the ball-far full-back has a starting position in the defensive line, he quickly understands the situation and moves out to occupy the open spaces. By switching into this space, the pressure can be relieved and the opposition’s access temporarily broken as they must shift horizontally to re-establish a better defensive position. Acting as a free man, this full-back can then be an important outlet for Empoli to then progress the ball upfield. Although the opposition can shift to cover the now-open full-back, Empoli can move the ball upfield to some extent before being challenged. Once met with defensive pressure, it’s common to see them move back inside and attack again from the midfield, just now in a more advanced position. This 3-man defensive line with a fully-maintained midfield supports Empoli in their defensive transition too. Whilst the diamond in midfield provides strong access in moments shortly following turnovers, the defensive line is well-equipped to defend any long balls attempted by the opponents. If Paredes were to drop between the centre-backs, then the back-3 would be still created but at the expense of an extra midfielder who could be crucial in their attempts to cut out any passes to start the fast break. Just like compactness plays such an important role in their offensive game, the basis of Empoli’s defensive organisation is established on a narrow and tightly-knit block. Organised between a 4-3-1-2 and a 4-3-3 shape (depending on the orientation of Saponara), they retain the compactness from their possession game with short distances between the players. The prime concept in the organisation is to have strong occupation of the central zones in order to restrict the opposition’s capacity to play through the middle and force them to resort to wider spaces instead. Empoli are extremely compact in defence. Through defending the centre with high levels of control, Empoli are one of the best teams in Europe when it comes to forcing the opposition towards the wider areas of the pitch. As shown in the below graph (taken from @Saturdayoncouch’s article found here) they have the second highest proportion of opposition attacking completions in the wing-areas. Empoli are second in Europe for forcing the opposition to the wings. With Empoli exerting defensive control over the centre and half-spaces, the opposition are often forced to resort to attacking in areas closer to the touchlines. This gives Giampaolo’s side the immediate upper-hand in defending the opposition, as the wide areas of the pitch have a low strategical value in comparison to the spaces closer to the centre. The centre is the best connected space, the wing is the least. To begin with, the position of the wing-spaces are the outermost areas on the pitch and thus the most isolated. As shown in the image above, the wing is the most secluded area of the pitch with great distances to the half-space, let alone the opposite flank. Compare this to the centre and the difference is clear – the longest horizontal distance to any area is just over one space (either half-space) whereas from a flank, this distance is over 3 – both half-spaces and the centre. The (lack of) efficiency of crossing is clear to see in this graphic. Furthermore, the attacking potential of the flanks is weak too. Whilst the centre contains a plethora of attacking possibilities and angles and the half-spaces have strong value because of their diagonal angle towards the goal amongst other reasons, the wings are much weaker. One of the most common means of attacking from either flank is through crosses, something which has been shown to have a terrible efficiency when it comes to creating strong shot opportunities. A fairly recent paper “Crossing in Soccer has a Strong Negative Impact on Scoring” by Jan Vecer concluded that if teams reduced their amount of crossing, then they could expect to score 0.57 more goals per game. The variability of these spaces is a big factor in the limited attacking potential. When comparing the wings, half-spaces and centre, each column of the pitch offers different attacking values, with differing means of attacking and tactical usefulness. Not only does the area you’re in have an important influence in the attack, but the areas in close vicinity do too when looking at the ways the attack can break down the defence. 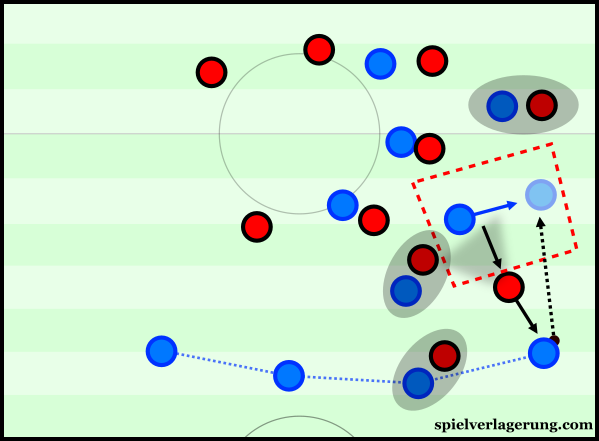 From this perspective, the wings are clearly the weakest area with the above-stated limited value from the flank with only one parallel area as the touchline cuts off one side. 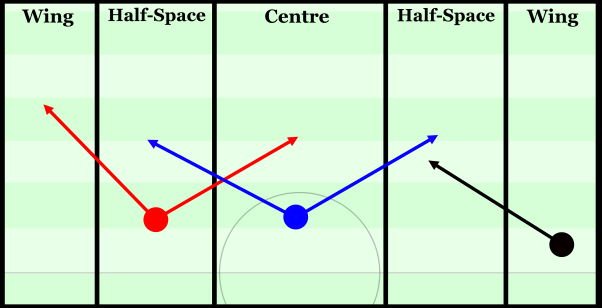 The centre of the pitch is sided by the half-spaces which although not necessarily a bad thing, results in reduced variability with both half-spaces generally offering the same opportunities. In this case, the half-spaces are best as not only is there a high attacking potential to begin with, but it is sided by a wing-space and the centre, two areas which offer very different means of attacking. Although the wing-space is not threatening individually, the variability from the half-space can be a useful tool to restrict the defence’s ability to anticipate the next move. It is for these reasons, why nearly every top-tier defence in football aims to force the oppositional attack into wide areas where they are of a much lesser threat. The fact that Empoli do it with such frequency is a strong point in their defensive game, as it allows them the opportunity to nullify the threat of the opposition offence by restricting them to wider areas. So, how do they manage to achieve this? Obviously their compact shape is one of the most important factors in this. Through covering the centre and half-spaces, they can commonly force the opposition to pass the ball towards the uncovered wide areas instead. Taking a closer look at the spacing of the team, it’s clear to see that there’s more factors than just the compactness in their attempts to force the opposition wide. When pressing into the opposition’s half, the front three cover any passing options into the middle of the pitch in their option-oriented defensive scheme. Whilst the two strikers split slightly, Saponara can move up and is more man-oriented. This allows him to cover the deepest opposition midfielder in order to stop the pass which many teams would prioritise and look for first. In deeper positions, the midfield cover the space behind and can slightly adapt their positioning to cover any nearby opposition players. Between the two central midfielders Parades can often be less man-oriented and instead look to cover the space, using the ball as more of a reference point for his positioning. Empoli’s pressing shape during build-up. Empoli can become extremely compact when pressing wider areas. Through blocking the passes into the midfield with cover shadows and staggering, the opposition are inclined to move the ball towards the wings. Upon this moment, the block shifts with high intensity to follow the ball and increase the ball-local compactness close to the touchline. By covering the spaces around the ball, Empoli look to stop the opposition from being able to move the ball back inside into strategically-better areas. From this, they can utilise the presence of the touchline to bolster their press – since the sideline halves the amount of available space for the ball-carrier making the pressure more difficult to evade. A key player in these actions is the ball-near central midfielder, who quickly rushes out to pressure the spaces around the ball and cover any passes immediately back into the centre. The ball-near striker supports him in this as he drops diagonally to close him down too whilst blocking any passes back into the defensive line. In a more central position, Paredes shifts to much less of an extent and remains fairly close to the middle of the pitch. From this position, the six covers the space diagonally into the middle, further enhancing Empoli’s control of the centre whilst helping to restrict the opposition from moving the ball back inside. Saponara does a similar role but is often more man-oriented as he maintains coverage of the opposition defensive midfielder. Empoli shift well to maintain access and press effectively in wider areas. 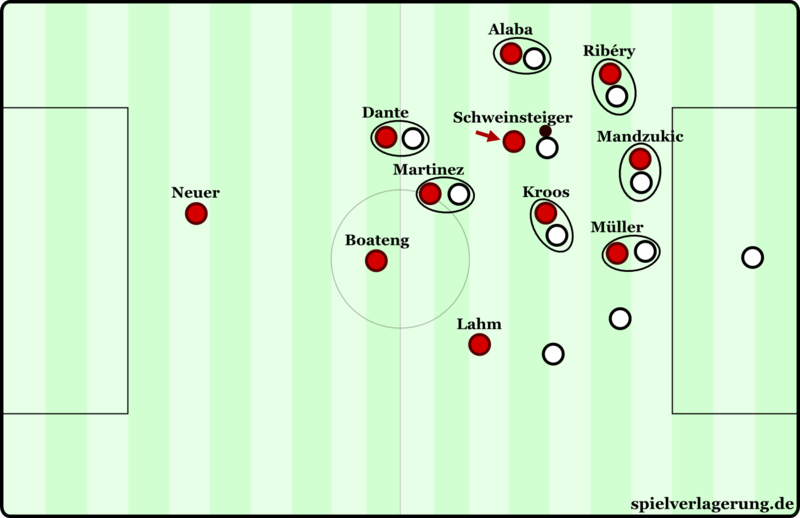 In cases of pressing high in the opposition third, it’s common to see the ball-near central midfielder’s role exaggerated as he moves up to support the press. If the opposition have the ball within their own third and are looking to pass the ball out from the defence, then the ball-near central midfielder can adopt a very high position to ensure coverage of any passing options in order to force a long-ball. As shown in the below image, Juventus’ shape is focused on building possession through their right with a large number of players positioned there. In reaction, Büchel has moved into a high position where he has access to three Juventus players from the left half-space. With Saponara and Maccarone, the trio can fairly effectively cover 5 Juventus players allowing for greater numerical dominance in deeper positions for the impending long ball. Some defensive stability is lost during these situations due to the central midfielder’s movement however. The rest of the block doesn’t always shift across sufficiently and as a result compactness can be forfeited to some extent. A distinct disconnect can occur between the ball-near central midfielder and Paredes if the shift isn’t co-ordinated correctly which gives the opposition some opportunity to exploit. Saponara can cover one opposition player if he moves into this area but overloads are possible to create a free man and unlock the Empoli press. Following their initial attempts to press, Empoli are quick to drop back into a deeper mid-block. Like many other features of Empoli’s system, this is tailored towards maintaining stability at all times – even though they fall back perhaps slightly too early in the opposition’s possession. Despite having a situation under control with a defensive block in an advanced position, Empoli can still drop deeper into their own half and essentially waste a more favourable situation higher up. 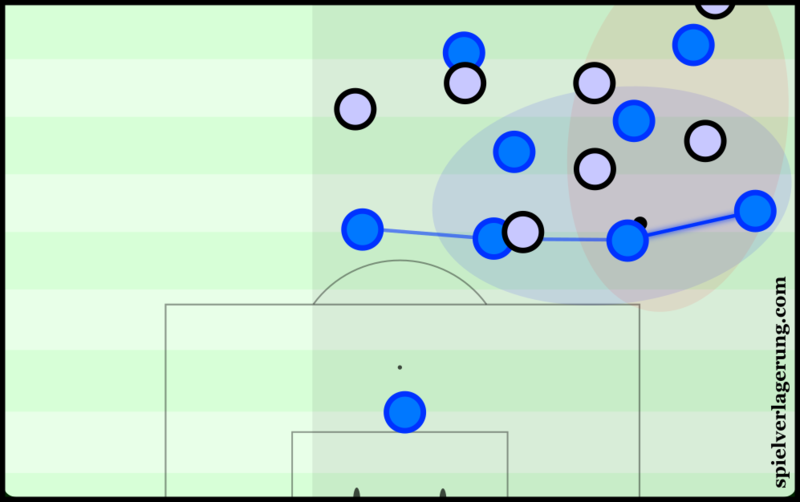 In order to force the opponents wide in deeper positions, Empoli maintain their high levels of compactness to restrict the opposition’s ability to play in more central areas. The diamond in the midfield can flatten into more of a ‘3-1’ shape with the two central midfielders moving out into positions where they can better support the wide defence. Just ahead of them, Saponara covers the space in front of the midfield trio and can be quite man-oriented at times to stop any opposition players becoming free ahead of the defensive block. Empoli’s compactness in deeper areas. Through their compactness, they again shepherd the opposition into attacking in wider areas by stopping them from playing in the centre. The high pressure areas force the ball away towards areas of lower pressure, where Empoli are far more content to defend. With the centrally-focused block, these low pressure spaces are largely on either flanks as well as in deeper positions further away from goal, where the ball is in less of a threatening position. Once the ball is forced towards the touchlines, the ball-near central midfielder shifts across and adopts a position close to his full-back. The pair are generally able to defend wide situations effectively with the possibility to double-team isolation situations. If the opposition aim to overload these moments, they can diffuse the situation with support from nearby teammates. The ball-near CM shifts across to support in wide defending. Just like the situations in higher areas, the full-back and central midfielder restrict the opposition’s capacity to move the ball back inside towards the centre and aim to force a pass further back away from goal. They cover diagonal passing lanes towards the box whilst the central midfielder in particular presses horizontally to cover immediate options. Saponara moves over and often covers a nearby option and as a group, the trio make a deeper pass one of the few options available. 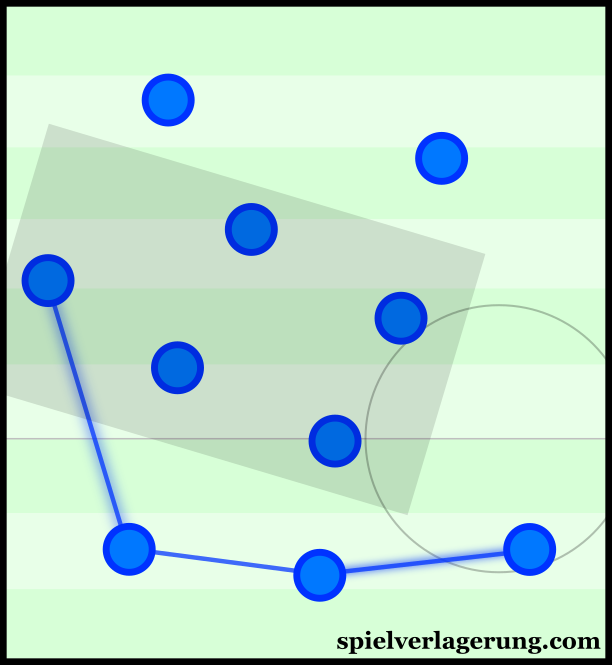 When looking to press the opposition up in the higher areas of the pitch, Empoli use the ball as the primary reference point for their positioning. As a result, Empoli’s defensive scheme is based around the options of the opposition and how they can organise themselves to minimise the threat of the identified possibilities. Constantly shifting in relation to the position of the ball, the Empoli defence also uses reference points such as their teammates as well as the opposition at times to create an effective shape. Because of the option-oriented defence, the defence shows a high capacity to adapt to the situation as the defence remains secure in most scenes by shifting to have a stronger situation-specific organisation. They frequently know how to adapt to changes in ball position and opposition structure to maintain coverage of the key areas in the moment. The accuracy and speed of these defensive movements are particularly impressive as the team are able to shift effectively against the ball-movement to maintain access and ball-local compactness. Sitting in middle of the Serie A table, Giampaolo has taken over Sarri’s team and done well to maintain and develop a number of features which were installed by the now-Napoli coach. However, it doesn’t need to be mentioned that there are multiple areas of their game in which they should look to improve for next season. As I mentioned earlier on in the analysis, Empoli don’t necessarily press during their defensive transition despite their system being very much suited towards doing so. With a compact shape and short passes being made, Empoli are nearly always in short distance to the ball when it is lost, whilst their narrow structure gives them strong presence in the nearby spaces. When Empoli lose the ball at the moment, they instinctively drop back with little direct pressure on the ball as they look to re-organise themselves in a deeper position. Giampaolo would be required to alter their ‘instincts’ and have their immediate reaction be to apply pressure directly around the ball instead. If he doesn’t manage to develop their reactions sufficiently, then the counterpressing wouldn’t be as effective and would likely be more disjointed and uncoordinated. As noted in RM’s excellent theory article, there are a number of different forms a counterpress can take and depending on the option he chooses, Giampaolo will also need to tailor his players’ reactions to react in the according manner. 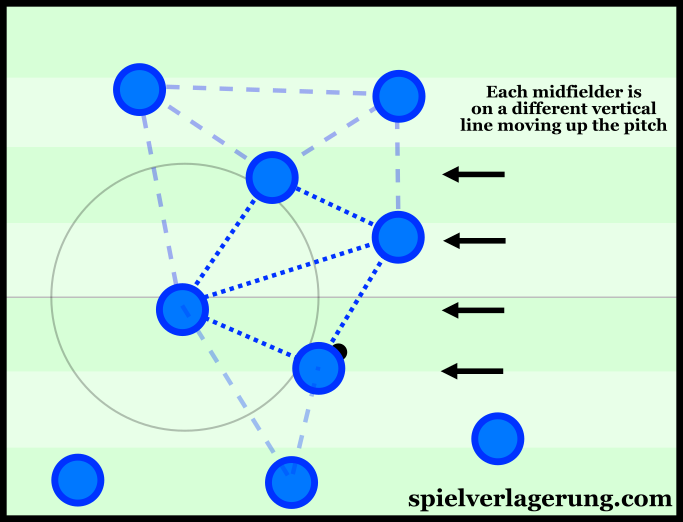 For example, if he aimed to have his players counterpress with a man-orientation, he would need to train his players to cover the nearby opposition players. However, if he were to choose a passing-lane-oriented approach, he would instead train them to cover the different passing lanes from the intercepting opposition player. Not only would a counterpressing approach give them the potential to regain possession of the ball with the possibility of creating chances up the pitch, but it can help further stabilise the transition from possession to defence. By applying pressure on the intercepting opposition player, a team would immediately restrict his ability to play the key pass which could break open their defensive shape. Although they may want to retreat into a deeper block to protect the spaces closer to their goal, immediate pressure can help secure this shift even if it doesn’t result in a regain of possession. From a more attacking-focused perspective, Empoli could benefit largely from developing a more variable attack. Currently, their compact positional structure and vertically-oriented passing has resulted in an attack which can be rather repetitive. The tight spatial occupation means that they can often be rather limited in terms of the amount of space which can be utilised and thus their attack can lack options at times. Aside from their situational switches when the ball-far midfielder or forward moves away from their block, the attacks can be isolated to specific areas of the pitch. This can be beneficial from the perspective of an oppositional defence, as it allows them to better prepare for what Giampaolo’s team will throw at them. The less variable an attack is, the fewer possibilities the opposition has to account for when preparing a defensive strategy. This can then allow for a more focused defensive scheme which can be better tailored to stopping Empoli’s primary attacking tactics and outlets. With said compactness being such a key area of their game, this is quite problematic for Empoli as to move away from these characteristics would be a significant departure from vital components of their system. Therefore, they must find ways to increase the variability of their attack without sacrificing the nature of their game. How could Giampaolo achieve this? He may look to increase the variability of his team within the tight spaces which they currently play through. Considering the limited space available, this could be difficult but not necessarily impossible. The use of combination plays can become quite an omnipotent tool in attack as it can be utilised in many different sequences and to prime a number of different attacking actions. Alternatively, he could look to restructure the system to better facilitate attacking variability. This is more viable over the summer considering that the starting eleven is likely to alter to quite an extent through finished loans and possible transfers. A good way to foster variability is through asymmetry in the attacking structure, which allows for different attacking approaches to be made in different areas of the pitch. Ultimately, this factor is dependent on how Giampaolo values his system. Its highly possible that the manager is content with the attacking scheme he currently has and will simply look to develop from that. Whilst the transfer window may be an opportunity (and possible present a necessity) to adapt his system, he may prefer to stick with the compact and narrow approach which has proved successful so far. Although the squad currently contains a number of talented young players, Empoli has a big problem – they don’t own many of them. Piotr Zielinski, who has 4 goals and 4 assists and the 7th highest dribble rate in the league is currently loaned from Udinese. The star of the system at the 6 position, Leandro Paredes is due to return to Roma at the end of the season too. In addition to these two prospects, first choice ‘keeper Lukasz Skorupski is set to head back to the capital alongside Paredes whilst Marcel Büchel is contracted by Juventus. Furthermore, Giampaolo will have a big challenge to keep a hold of the key players who are contracted to the Tuscan club. Riccardo Saponara was linked with Liverpool at the end of 2015 and has recently been discussed in the same sentence as Italian giant Juventus. Without the financial capabilities to compete with these bigger clubs, it will come as no shock if the small club lose multiple important players over the summer of 2016. A task of similarly-difficulty will come in replacing the losses adequately. With Paredes they found an excellent replacement for Valdifiori but now with the young 6 returning to his parent club, Empoli are once again tasked with finding another suitor to a key position in the tactical system. Regardless of what the summer holds, Empoli’s first season under Marco Giampaolo has undoubtedly been a successful one. The coach has done well to not only maintain but further develop the system which Sarri left behind in Tuscany and I’m excited to see where their system will progress next. Thank you to the twitter account FussballRadars for providing the radars for Zielinski and Paredes! I recommend following them for regular content, they take player requests too! Sadly Giampolo recently anounced that he´ll leave after this season. Where will he work next season? Will he stay in Serie A? There were some rumours with Milan, which would be great.